MVT&FL Match 3 took place at The Dell in unseasonably warm conditions. Once again and in spite of the high temperatures, B&R AC produced some fine performances with five new club records being set on the evening. They again retained third position in the league. Polly Gerner claimed victory in the W60 100m, following this with a seasons best in the triple jump and second place and a new PB in the W60 high jump. Sharon Samuel won both the W50 100m and 400m setting new PB’s in both. Debbie Ricci ran strongly to gain second place in the W40 100m and also gave a seasons best performance in the 400m. Rita Brownlie, although still recovering from injury, kindly stepped in to fill W40 javelin place. Lucy Bristow gave a fine performance in the 1500m, achieving second place. Mary Morris ran well in her 1500m debut, setting a new W55 club record in the process. The evening concluded with a very fine Medley Relay performance from the B&R relay team of Ricci (200m), Samuel (200m), Frost (400m) and Bristow (800m). They ran brilliantly to achieve second place overall. Their combined time sets a well-deserved new club record, excellent work ladies. With absences in the M60 and M70 events the men’s team rose to the challenge and claimed 3rd place. Several SBs and PBs were collected throughout the warm evening. Paul Husbands ran a PB of 12.7 seconds over 100m and won the M40 LJ with 4.80m. Chris Gibbs also ran a PB in the M35 100m – 12.3 seconds. Both men took part in the medley relay (200, 200, 400, 800) at the end of a tiring evening along with Martin Aspley-Davis (400) and Calvin Scoltock (800). The men lead for the entire race but were just beaten by just 2.5 seconds in a thrilling race. Calvin won the 2km walk and ran a SB over 1500m. Making a gentle return from injury, Martin came 2nd over 400m, 2nd in the PV and won the 100m with a SB of 12.9 secs. Brian Alner once again earned valuable points stepping into the M50 1500 and achieved a PB of 6:23.7. Over 1500m in the M35 race Andrew Freeman ran a tough race to finish in 5th position. In the field, Mike Neylon threw the javelin to achieve 3rd place and a PB. Vito Ricci, on his M50 debut for the vets team, threw the 6kg shot a PB distance of 8.95m. Next meeting is at Worcester on July 25. 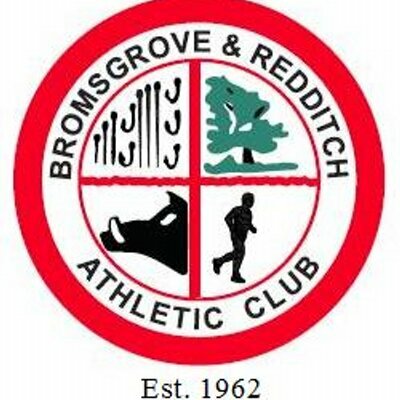 Copyright © 2019 Bromsgrove & Redditch Athletic Club, All Rights Reserved.